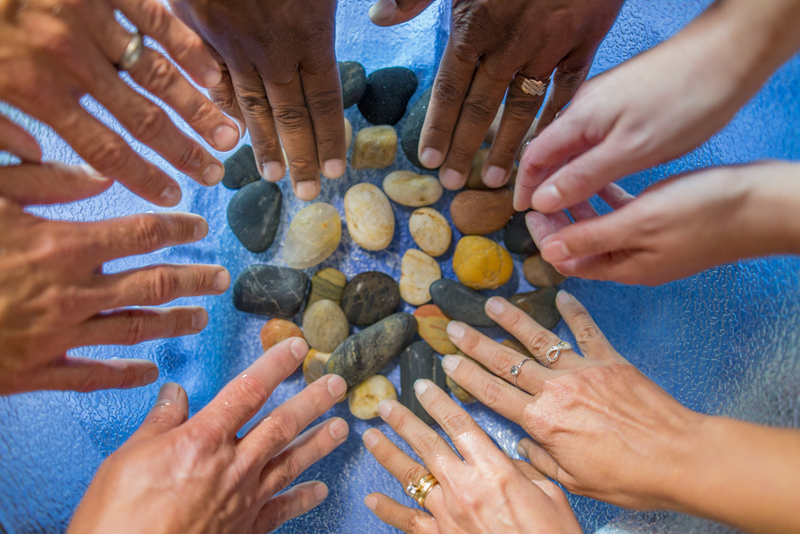 Eastern Mennonite University faculty and staff dipped their hands into bowls of water as they received a blessing on their work for the coming year. The sacred ritual concluded the Aug. 15-16 faculty-staff conference which opens each academic year with worship, singing, plenary and breakout sessions, shared food and shared stories. 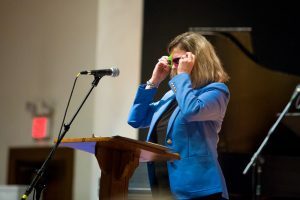 President Susan Schultz Huxman dons one of three pairs of glasses during her keynote address. This year’s theme — “Expanding the Legacy, Enlarging the Tent” — emphasized integrating EMU’s history and traditions with a vision for its second century; the conference also officially launched EMU’s centennial year celebrations. EMU is well-poised with “strong vision and high purpose” for the future, she said. Merging perspectives of hindsight and foresight with Anabaptist-inspired insight, she noted EMU’s strong and vibrant historic legacy; a robust, holistic and distinctive education that includes cross-cultural study and faith formation; and a cohesive, faith-filled community of faculty and staff. 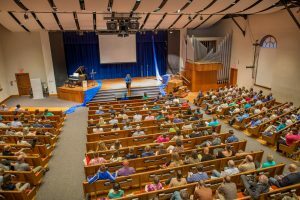 “We have just begun to promote a vibrant future of counter-cultural Mennonite education, one that prepares our students for relevant and in-demand careers and meaningful spiritual lives shaped by the reconciling love of Jesus,” Huxman said. While praising EMU’s entrepreneurial spirit, epitomized in pioneering professor emeritus and philanthropist Margaret “Speedy” Martin Gehman and Alumnus of the Year Anxo Perez, Huxman noted new academic offerings: the Doctor of Nursing Practice program, offered collaboratively with Goshen (Indiana) College, as well as the new four-year engineering program and a neuroscience minor. Approximately 380 new and returning employees participated. The fall semester begins Monday, Aug. 28. Faculty and staff fill Lehman Auditorium Aug. 15 to hear President Susan Schultz Huxman’s keynote address. A panel of respondents to Huxman’s speech included Carl Stauffer, Lauren Jefferson, Vi Dutcher and Marci Frederick. The final session of storytelling, a much-loved tradition, included Sandy Brownscombe, David Evans, Steve Johnson, Ryan Keebaugh and Dawn Lambert. Special guest Donald B. Kraybill provided a one-hour preview of his forthcoming Centennial history, Eastern Mennonite University: One Hundred Years of Counter-Cultural Education (Penn State Press, 2017) to be released at the Oct. 13-15 Homecoming and Family Weekend celebration. Shifting Paradigms, Shifting Power: Diversity and a New Radical Anabaptist Community — Professors Melody Pannell and Mark Sawin traced the history of racial-ethnic diversity at EMU, with special attention to current diversity trends and shifting paradigms. They asked, “How could and should paradigms and power structures shift? How can and should our new diversity help us more fully understand and realize the radical nature of our Anabaptist values?” Click here to read more. Drinking in Knowledge at the Source: EMU’s Cross Cultural Program — A panel of five experienced cross-cultural program leaders discussed one of EMU’s most unique academic programs and included Ann Hershberger, professor and interim cross-cultural program director; Linda Martin Burkholder, program assistant; Ervie Glick, emeritus professor; Byron Peachey, cross-cultural leader and adjunct instructor; and professors Kim Brenneman and Kimberly Schmidt. Creating a Beloved Community at EMU: Organizational Culture as Blessing and Barrier — Professor David Brubaker discussed culture and sub-culture identities as both assets and liabilities. He invited the group to list both blessings and barriers to EMU’s culture (and multiple sub cultures), noting that you must first understand your own organizational culture before you can interpret for — and thus fully integrate — newcomers. 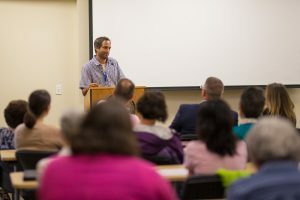 “Thy Word is Truth”: Old Song, New Tune — Professor Nancy Heisey, associate dean of Eastern Mennonite Seminary, and Professor Peter Dula discussed “word” and “truth” as the biblical writer imagined these words, and engaged with ways that the motto speaks to EMU at 100 years.